Perhaps it’s no coincidence that Justin Timberlake’s 2013 concert tour was called the 20/20 Experience World Tour. For it was during that show’s stop in Oklahoma that JT’s massive projection screen captured the attention of screaming fans and captivated the team at Gardner Denver. Showcased in colorful and exacting detail the screen was described in one recent concert review, as "a riot of hexagons serving as a honey comb scrim capable of reflecting and refracting lasers and lights flickering above, beside and behind them." 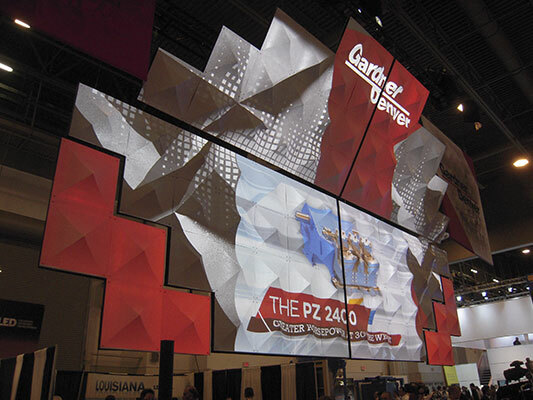 And while most concert goers saw JT rocking it out in front of the screen, the team at Gardner Denver had visions of that very same screen, made of contoured projection surfaces, taking center stage in their OTC2014 exhibit environment. Working in concert with the team at Gardner Denver, 2020 Exhibits focused on creating an environment that was equally show-stopping, delivering a wildly impactful experience for a slightly different yet vitally important target audience at the oil show of shows, the Offshore Technology Conference. And while it was discovered that JT’s screen was not only proprietary but worth many millions of dollars, 2020 Exhibits was not swayed. With dogged determination an equally magnificent projection screen, projector and video mapping solution was delivered. As a global manufacturer of oil and gas drilling equipment, Gardner Denver planned for OTC2014 to serve as the launching pad for a new branding campaign: BEYOND TOUGH - Tough isn’t Enough. With a brand identity firmly in place and clear vision 2020 Exhibits delivered. Employing a solid black-and-red color scheme, the exhibit environment reinforced the brand’s feel and focus. Amid comfortable meeting rooms, lead capture Media Suite and an open, seamless space plan, the exhibit's centerpiece and focal point was the 14.5-by- 27-foot project mapping screen, which stopped traffic with attendees, clients, dignitaries and the press standing three deep to watch. Anchoring the perimeter of the space was a comfortable H2O bar, where attendees could comfortably sit back and watch the Gardner Denver show, while enjoying a light snack. For those interested in seeing the Gardner Denver’s pump products up close and personal, the sample products were artfully and thoughtfully placed throughout the space. With several comfortable seating areas set aside for conversation starters, the Gardner Denver team stayed connected, using the 2020 Exhibits Media Suite iPad app to feature detailed product information, while tracking and capturing lead data. The upper deck conference room afforded privacy, for one-on-one conversations and key meetings. As a showcase Gardner Denver, OTC2014 succeeded brilliantly. From the front page of the Houston Chronicle to interviews with OTC TV, the Gardner team celebrated big milestones as a direct result of their participation and exhibit environment. 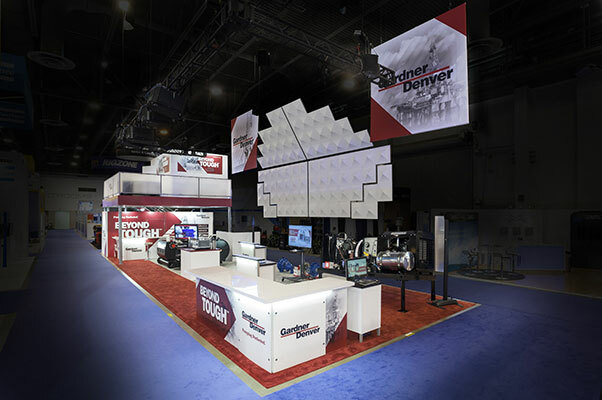 From multi-million dollar deals to successfully capturing the attention of more than 100,000 conference attendees, along with hitting a social media milestone -- reaching 15,000 Facebook fans -- Gardner Denver’s OTC2014 exhibit experience is one for the record books. Rock on.